Sculpture Factory is the latest iteration of Quayola’s ongoing research on classical sculpture and has been developed with the technical expertise of DARLab from London South Bank University (LSBU) and in collaboration with Autodesk Delcam UK and QD Robotics. LSBU is one of the few academic institutions around the world using robotic automation to perform both subtractive and additive manufacturing processes. The newly renovated DARLab contains a Multi-function Robotic Platform, a robotic platform able to process different materials with custom equipment and tools. It uses sophisticated technology to perform architectural fabrication research and can be easily modified, allowing many different tasks to be configured. Federico Rossi’s role as Technical Director means that he has played a major role in helping to develop the robotic setup for presentation at the Ars Electronica, where the industrial robot sculpts large scale digital sculptures in a live exhibition space. 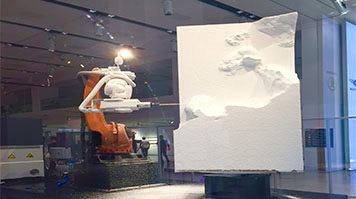 Guided by sequences of algorithms, the robot live-sculpts endless variations of ancient Greek masterpiece ‘Laocoön and His Sons’ out of a bespoke marble-filled resin. Whilst never completing the full figure, each attempt discovers new articulations of matter. The result is a hybrid vision - a slow process of discovery not focused on the original figure but on the infinite possibilities of how to reach it. Inspired by Michelangelo’s technique of “non-finito” (unfinished), the installation explores the tensions between form and matter, real and artificial and old and new, using unfamiliar strategies and patterns to recreate the original artist’s hand-sculpted unique craftsmanship. “The DARLab once again is breaking the boundaries of digital manufacturing, proving that robots and creative programming can do to something never seen before. “It was wonderful to showcase the robotic arm as main installation at Ars Electronica. The arm has been really popular and has drawn a lot of interest from the audience, and it’s brilliant to see that our hard work is being well received. Find out more about the DARLab and the School of The Built Environment and Architecture.